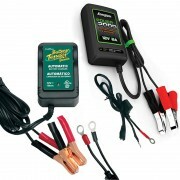 PowerSports Battery Charger Maintainer TenderThere are 6 products. PowerSport Battery Charger Maintainer Tender. 12 volt or 6 volt Battery charger maintainer tender for all power sports. Energizer, Deltran Battery Tender, Optimate desulfating charger by Tecmate. We have the charger that you need to properly care for and maintain the battery for your motorcycle, ATV Quad, Side x Side, Jet Ski PWC, Snowmobile, Scooter. Keep your battery healthy with Energizer Power 1000 12v 1a, Power 2000 12v 2a, Power 4000 12v 4ah, Deltran Battery Tender Junior 12v 0.75a, Tender Plus 12v 1.25a, Tender Plus 6v 1.25a, Tender Junior 6v 0.75a, waterproof power tender plus 12v 5a or Optimate 5 2.5amp to desulfate and charge sealed agm batteries. Energizer TecMate Optimate Deltran Battery Tender Charger Maintainer Free Shipping over $50 - Power Sport Batteries Buy Energizer TecMate Optimate Deltran Battery Tender Charger Maintainer for motorcycle ATV Free Shipping over $50.